Sell your iPod to Gazelle. It takes just a few minutes to sell your iPod. What Happens When I Sell My iPod? To sell your iPod or not -- that is the question. And the answer is, yes, by all means. You don't need to be a rocket scientist to see why recycling your phone is one of the best things you can do for yourself and for the environment. You've come to the right place. Gazelle is a fast, simple, and intuitive way to get fast money for your iPod, and it takes just seconds to get started. We'll ask you a few questions to help us assess the value of your phone. Then we'll make you our very best offer possible. Accept it and you'll receive a pre-paid box. Insert your device and send the box back to us. The iPod buyback offer expires in 30 days. Once we get your iPod, we'll look it over to confirm that the price we gave is accurate. If your iPod trade in is worth more or less than the original assessment, we'll email you a new offer that you can either accept or pass on. There's no financial investment or risk from your side. If you change your mind or don't like the price, then we'll return your iPod to you without charging you a dime. That's just how we do business. Now, assuming you are good with our offer, our next step is to help you sell your used iPod as quickly as possible. We give you three options for collecting your payment: A check, a deposit in your PayPal account, or an Amazon gift card. The sooner you send us your phone, the faster you'll get paid. Again, in order to sell your iPod, the first step is to find out how much it's worth. It takes just a minute on Gazelle and doesn't cost you a thing to find out how much your payout will be. Give us a try - you won't believe how epic it is to get a fast payment, and how easy. It's why more than one million people have used Gazelle to recycle their used iPods, smartphones and other devices. 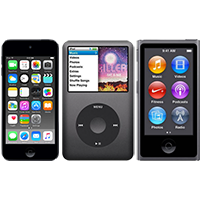 Remember, iPods depreciate in value over time, so get started today!